The Calgary Flames will be looking to continue their winning ways tonight when they play host to the Arizona Coyotes and attempt to maintain the positive momentum of what’s been a successful homestand so far. The Flames, led by veteran forward Michael Frolik, once again displayed their flare for third-period dramatics in their latest contest by rallying to earn a 4-3 victory against the Florida Panthers. Frolik being a driving force in the team’s fourth straight win seemed an unlikely development after he began the night relegated to fourth-line duties. He was reunited with his 3M linemates Mikael Backlund and Matthew Tkachuk to start the second period and that strategy provided a huge spark for the Flames as they upped their Western Conference-leading record to 29-13-4. 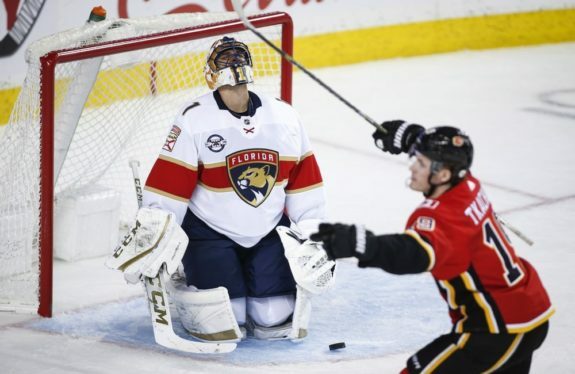 The Flames turned in a listless opening period by falling behind the Panthers 1-0 and the situation turned even bleaker when they surrendered an early tally in the middle frame. Frolik got the Flames back in the contest when he trimmed the deficit to 2-1 with a nifty deflection of a Backlund point shot and later added a pair of helpers. It was Frolik’s perfect pass to set up Tkachuk’s third-period goal that gave the Flames the lead for good. Surprisingly, even though Frolik, Backlund and Tkachuk all notched goals in a 5-3 win over the Colorado Avalanche in their previous contest, it was Austin Czarnik who got the nod from head coach Bill Peters on the second line to start the game against Florida. Peters felt it necessary to shake things up after the porous start and the Flames suddenly became a different team with Frolik leading the charge with his increased ice time. Frolik has had a trying 2018-19 season at times with things finally reaching a boiling point after the Czech Republic native wasn’t in the lineup for a Dec. 29 home date against the Vancouver Canucks. His agent, Allan Walsh, took to social media to wonder aloud about the move to make Frolik a healthy scratch for the second time this season. 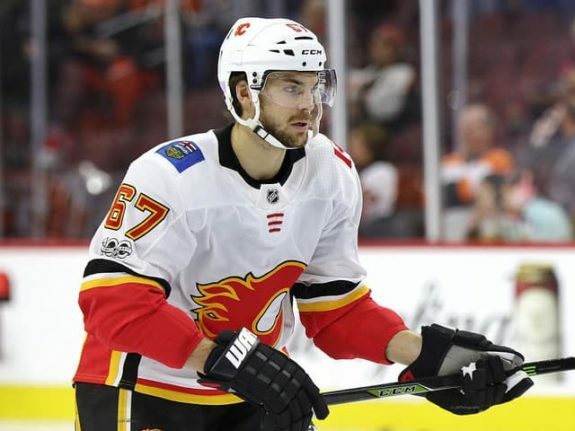 While Frolik’s long-term future as a member of the Flames may be an unknown quantity after finding himself in the middle of an undesirable situation, his play since that time has been impressive. He’s registered four goals and four assists in his last seven games and is a solid plus-seven during that stretch. Peters, who was named the head coach for the Pacific Division at the NHL All-Star Game in San Jose later this month, seems to be pushing all the right buttons in his first season in Calgary. Frolik has shown his true professionalism by responding in a positive manner from some of the personal adversity and challenges he has faced. After being a healthy scratch early this season for an Oct. 13 overtime victory in Colorado, Frolik rebounded with a two-goal performance in his next game against the Boston Bruins in spearheading a 5-2 Calgary victory. He’s seemingly been in peak form since the late-December controversy. He was inserted back into the lineup for a Dec. 31 date against the San Jose Sharks and began his recent spell of productive play with a two-assist effort in an 8-5 victory. The 3M line combined to produce eight points in that highly entertaining affair. While Frolik hasn’t been receiving as much ice time this season under Peters as he’s been accustomed to, he’s definitely been opportunistic. He’s registered 11 goals and four assists in 29 contests and is a plus-10 on the season. Those statistics are pretty solid given the fact that he missed 15 games as the result of a high-ankle sprain earlier this season. That’s traditionally an injury that takes some time to fully recover from. Peters made an interesting call by opting for Elias Lindholm, instead of James Neal, to play alongside Johnny Gaudreau and Sean Monahan on the Flames’ top line this season and that call has been a brilliant one. That unit, led by the dynamic Gaudreau, has become one of the best top lines in the game as the Flames have ascended to lofty heights. While that head coaching decision has paid off in spades, Peters has opted not to go with the 3M line on a full-time basis by tinkering with that second line. While Sam Bennett, in particular, and others have been given the opportunity to play alongside Backlund and Tkachuk, Frolik has seemingly proven himself to be the best fit. The Frolik, Backlund, Tkachuk trio was a revelation for the Flames during the 2016-17 season under previous head coach Glen Gulutzan, but unfortunately there was a drop-off in 2017-18. The production from Frolik and Backlund slipped and their plus/minus ratings also trended in the wrong direction in what was a season to forget. This season, despite the games missed due to injury and playing on different lines, Frolik has already surpassed his goal total from the 2017-18 campaign when he played in 70 games. With the 3M line apparently now going strong thanks to Frolik’s recent offensive exploits, Tkachuk’s career season and Backlund’s game rounding into form, it might not be a bad idea for Peters to keep the trio together on a more consistent basis. Frolik is healthy, productive and playing with a definite edge. Their chemistry seems undeniable and Frolik has shown the ability to rise above controversy with his recent standout play. That’s good news for both the Flames and their loyal supporters.